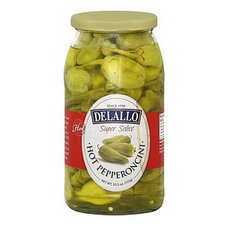 Enjoy Delallo Hot Pepperoncini. The Pepperoncini Is The Archetypal Pepper Of The Italian Antipasto Tray, In Both Its Mild And Hot Forms. We Offer Both Types, To Mix And Match According To Your Heat Preferences. Use Them As Part Of Your Antipasto Platter, Or Slice Them For A Flavorful Addition To Salads And Sandwiches. Hot (Note: Description is informational only. Please refer to ingredients label on product prior to use and address any health questions to your Health Professional prior to use.